Seeing some reddit users joke about a meme stock exchange which could be made into reality. 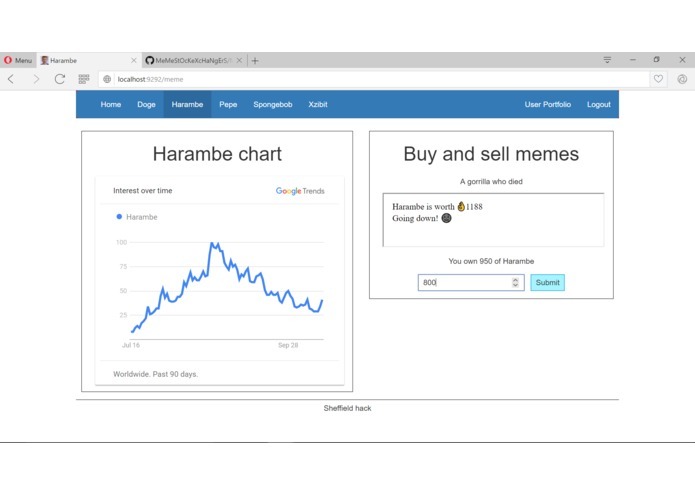 Lets you buy and sell memes with their value updating according to real trending data on Twitter. 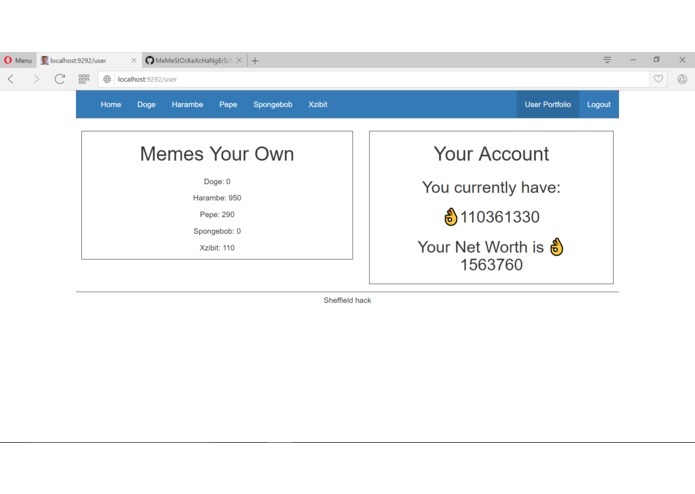 We made a HTML+CSS website and then introduced Bootstrap to provide a nav bar, whilst also creating a Ruby and database setup to run a server and merged in the Ruby to the HTML and then pulled the meme trending value from Twitter's API to go into our database. Twitter's API was not straight forward. Google Trends does not have an API and the embedded link from their own site was completely broken. Strong team building skills - allocation of tasks and dealing with bottlenecks in plan. Ruby does not work easily on Windows and Google trends does not have an API. Twitter's API is extremely confusing and had to be hacked to get to work. We learnt how to use some Ruby gems (rufus-scheduler,twitter) and to interface with a database through Ruby. 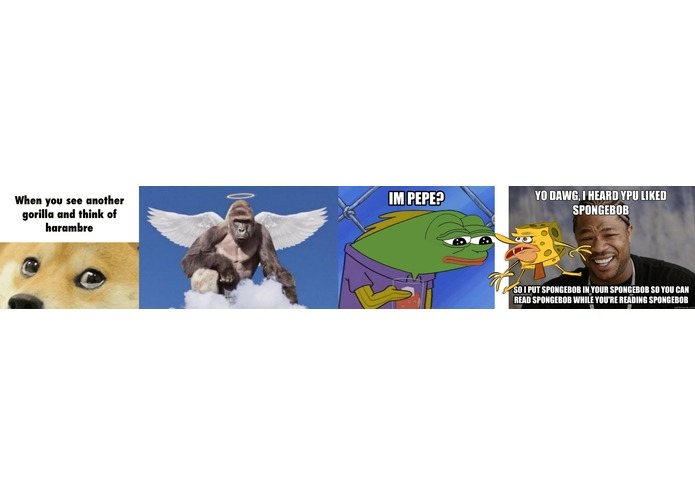 Running on a real web server, supporting logins and adding more memes or unrestricting the purchases to all memes. Hosting adverts on the site and creating a paid or ad based app. I turned the static HTML files into dynamic web pages as erb files. I also participated heavily in coding their controllers, particularly the login system with Twitter. I also helped colin code his database methods as he did not have an IDE, so I proofread his code and ran it. I worked mostly on the front-end, using Bootstrap to build a generic webpage, which was then rolled out to each meme page. I also was part of the pair which figured out how to embed Google Trends onto the webpage; this was much more difficult than anticipated. Once that was set up, we (the front end team) did help with the back-end, particularly with using the Twitter API. We were using the Twitter API to do something (i.e. count tweets) which we had never done before, and that posed its difficulties but we worked it out eventually. I worked on the back end code of our web app. I coded the low level functions which handled the interactions between our ruby controller an our database. I used these functions to build more complex functions which calculated basic stock trends and the value of the price of memes. I also worked on the twitter api which was used to take trending results to power our stock exchange. I worked mostly on the front end, making a basic prototype for the website and then styling it to look nice and be responsive - this was useful later when we needed to shrink the browser window and would allow us to make a website based app easily if we had the time. I also helped with some of the debugging with the Ruby code and trying to work out how to get value data from Twitter trends.